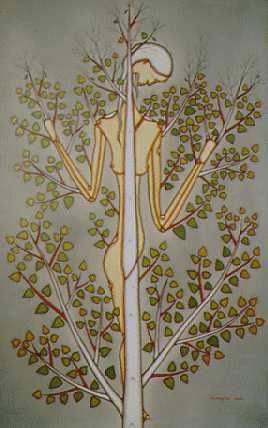 Blake Debassige's Dying Birch combines a legend painting appearance (the personified tree) with an environmental theme. Plants, fish, animals of Reserves and reservations near the Great Lakes are suffering serious effects of industrial air, acid rain, and water pollution. (See model resolution from Red Cliff Band of Ojibwe people; examine other information on the Great Lakes Region environmental server.) 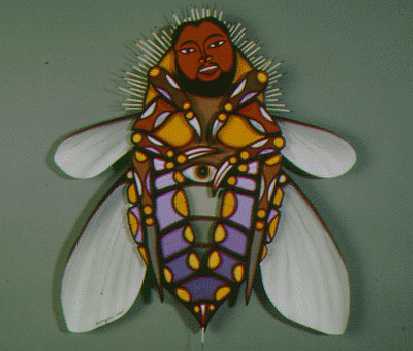 Debassig's Bee, if it expresses a legend, may show a branching out from Anishinaabeg traditional stories to the legends of other peoples -- such as Tamanwis of the Northwest Coast, who often manifested as a bee to men seeking visions. It also expresses the environmental theme in depicting an insect as a person, with a right to live, and its own mysterious beauty. Debassig has become more worldly in his themes and imagery, since his early paintings at Manitoulin Island in the 1970's, that depicted the artist's envisionments of traditional ceremonies such as sweatlodge, and his personal dreams. These two pictures are parts of an exhibition at the Royal Ontario Museum of Ontario, featuring 3 Anishinaabeg artists who have expanded and developed the Legend Painting that first inspired them with their own unique visions and techniques. Bee almost looks as if it has been influenced by some of Morrisseau's later work -- but where Morrisseau's is wholly sentimental and oriented to coming generations, Debassig's art, like his bee, has a sting in its tail, and even for the little insect, a feeling of joyful power in this generation. Leland Bell's Day of Remembrance is one of the most strongly influenced by Odjig's style that I've come across, but with his own unique vision of composition and more use of curvelinear outlines, less of sharp, almost abstract, curved-angular patterns than she typically uses. This depicts a danc often seen at powwows nowadays, the veterans of foreign wars are honored. The grey-headed old warriors carry both U.S. and Canadian flags in thir dance around the drum that is playing the honor song -- but these foreign flags for which so many Indian young men voluntarily fought (and died) have almost gone out of the picture. The fur-covered staff of eagle feathers now leads and points to a future which is being won by fighting smart in the longest war -- that for Indian rights, land and sovereignty. I wish that I had more of Bell's pictures to display, A Dream -- Chipmunk and Dancing which Bell did in acrylics when he was a student at Manitoulin Island in the late 1970's. To me it seems as if the chipmunk is dancing to tell some kind of story to elder tree spirits -- trees is what the snow-headed figures make me think of. 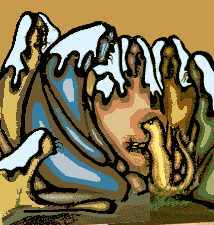 I think of snow-clad mountains and hills, too. Roy Thomas's "Woman and Nature" takes us to a third generation of Woodland Legend painters -- who have been influenced by Morrisseau, Odjig, and the spiritual and formal approaches of the Manitoulin Island painters whose art began in the late 60's. Woman is the large figure centering this painting, who, like central figures in the spirit-power paintings of Morrisseau's archaic-mystic style, is surrounded by a circle of spiritual power. 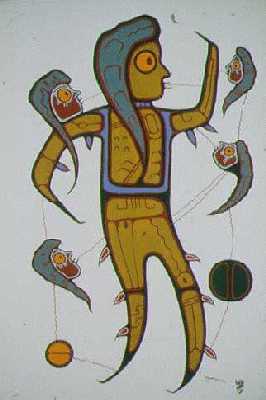 There are 4 Manitous or nature-spirits protecting, guiding, inspiring her at this critical stage where she is still a girl, about to become a woman -- like the 4 directions Manitous that figure so often in Midewewin instructional birch bark scrolls, and in Morrisseau's early paintings. Unlike those -- which give the definite visual impression of maleness -- these 4 direction Manitous as women relate to them, are female. One is perched on her shoulder in friendly fashion, 2 are conversing with her directly in front, and one hovers behind with knowledge of the past she will need. Additionally, there are two of the rayed power circles that represent what the Migiis symbolizes located on the surrounding power circle. The spiritualized woman-figure also shows x-ray anatomy, but this is stripped down, cryptic, as perhaps a man painting it can see only some pared-down abstract, surface parts of the ancient internal powers of woman. This powerful image -- one of those in the current ROM exhibit of Anishinaabeg artists -- closes the circle of 4 generations of Woodland legend painters,. Good Morning by Tom Chee Chee, a 3rd generation Manitoulin painter, His style was a very stripped-down elegance that emphasizes graphic design elements of the styles of Morrisseau's early paintings, and the hard-edge graphic style of Odjig (it is a style many Inuit printmakers have also settled on). His lines are calligraphic--varying in width as the artist's hand changes the angle and pressur on the brush. Chee Chee's life was sad. His father died a few months after his birth, his mother disappeared into the deadly swamp of city Indian skid-row alcoholism. This was a very strong motivation for his painting. He hoped she was still alive, hoped she would see one of his works and contact him, but she never did. A few years ago, at age 33, he killed himself, leaving a small legacy for the world of beautiful work. See brief bio note [Apparently no longer online] from a Hamilton, Ont. gallery that is selling a print of the Good Morning! duck. Martin Panamick occupies the place of honor in this gallery of Woodland-Manitoulin painters. If he had lived, a much larger world would know of his work and his awesome talent. The circle is not necessarily a closed form. It is possible to think of it as a rising spiral, higher and wider with each circuit, like a tornado, rising and ever-widening from the small, powerful funnel touching the earth's surface to a vast conglomeration -- roiling clouds, flashing lightning, sounding thunder -- in the skies above. The first circle began with Morrisseau, and the powerful inspiraction of the visual language he developed, which immeediately communicated itself to many Native peoples of the northern Woodland with immense power and inspiration. That inspiration was fostered and grew on Manitoulin Island, with the help of older Woodland artists, especially Daphne Odjig, and the Manitou Arts Foundtion, later continued by the Ojibwe Cultural Arts Foundtion, still active on the island. But the circle has widened, too. This gallery will be expanded from time to time, as I'm able to find more images and more info about these artists, and the powerful, beautiful paintings whose original and continuing inspirations are entirely Indian, but whose power communicates with anyone who has an eye responsive to artistic visionaries. CREDITS: Debassig's and Hanson's paintings come from the web part of a current exhibit at the Royal Ontario Museum, Art of the Anishnawbek. Accessing that page, you can see thumbnails in bigger (than the screen) versions, and also reach the page for the ROM bookshop, where a bargain-priced catalog for the show is available. The museum's photos were taken by Brian Boyle. Text and graphics copyright 1995, 1996.